This is Lucy an Australian Silky Terrier, she would like to be a working dog! Now you might wonder why they needed so many dogs, but the attrition rate is pretty high for the dishlickers. If a dog is running around after cattle for half a day that’s just about enough for most of them, so you need to change dogs if you are working all day. The dogs do get lifts on the motor bikes so they are not on their paws all the time. They can be kicked by a beast, run over by a bike or car, fight amongst themselves, get heat exhaustion or just run the pads clean off their paws. But the good ones love to work. Those who are left behind in the mornings howl for hours at their misfortune. There were kelpies, blue and red cattle dogs, border collies, coolies and mutts. Some like the cattle dogs were only used when a hard biter was needed to control the more aggressive cattle. Others were used as lead dogs to steady the mob down and then some dogs were all rounders. 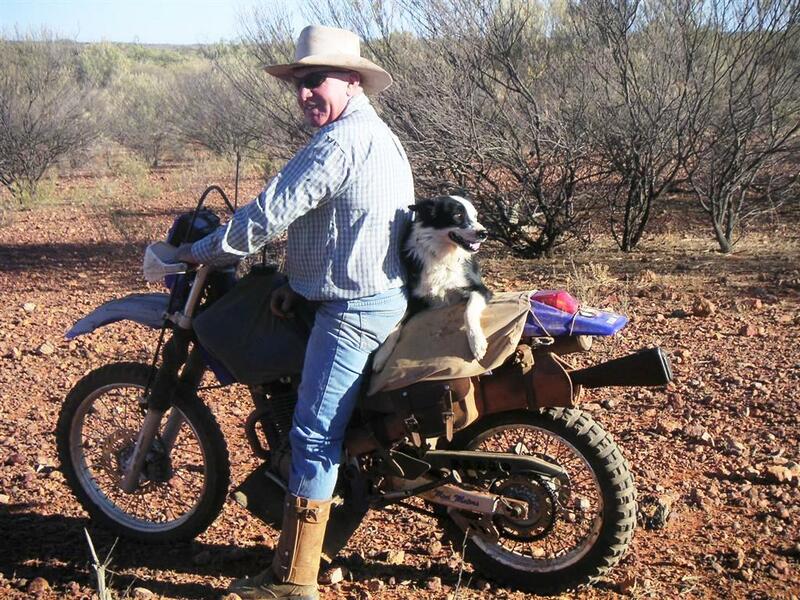 As the months went by he learned how to ride on the back of the motorbike and was introduced to cattle and work even though he was usually kept on a long lead so Greg could get him back. He was so exuberant, so much energy and personality and still cute too. On one of his first forays of his working life we had gotten a mob of cattle together at the southern end of the paddock ready to take them to the yards in the northern end, about 6 kms away. Greg made the mistake of taking the lead off for a minute to untangle him from a tree. That was all Rollie needed, he joyfully took off after the cattle and stayed behind them for the whole 6 kms as they galloped across the paddock. Greg was yelling at the dog to come back and riding behind him to try and get hold of him and that only made the cattle and Rollie go faster. A man up the other end of the paddock heard all the commotion and saw the cloud of dust coming but had no idea what was going on til he saw Rollie hard on the heels of the cattle. He called up on the UHF radio, “ Has this little black and white fluffy dog got an off button?” At that stage he didn’t. The dogs can be wonderful and nearly always make the job easier. A good dog is easily as good as having another man most times. But they can be vexing. We have been pretty busy this year with our visitors and amongst them we have had a lot of photographers. One of these was Nevil Lazarus who did an outback trip with a couple of other blokes and I believe they had a ball. They were certainly a happy crew with a job for everone – there was the navigator, the cook and the bloke who wandered around with the camera. This Cinnamon Quail Thrush was spotted on the way to our Lake Paddock. The budgerigars have been nesting here since early December – Talk about populating the west! These Great Crested Grebes are just gorgeous! This was taken in Benanga Creek which is one of the creeks that start on Kilcowera and fill Lake Wyara. Access to Lake Wyara is only to be had from Kilcowera as the roads to the lakes are closed on Currawinya NP at this time 22/7/2010. Cardenyabba Lagoon looks spectacular again and is home to stacks of these Plumed Whistling Ducks, lots of Shags, Darters, Cormorants and Pelicans to name just a few. Visitors are able to bush camp right on the side of the lagoon and witness all these birds doing their thing. And that seems to be eating all the yabbies and fish in the lagoon! This stunning Red Backed Kingfisher is another resident around the lagoon. Isn’t he a dork? This Red Browed Pardalote was found in our Kimberly Paddock in amongst the Mulga. And after a hard day traipsing around the bush they did sit back with a few nibblies, a beverage and a pretty good view to go with it.